With spring FINALLY arriving here in upstate New York, so do the flea markets. One super popular event is the Rhinebeck Car Show & Swap Meet. This car focused event includes a flea market with seemingly every single tool and car part you can imagine, as well as cars for sale and show. Rhinebeck is one of my dad’s favorite events and one we’ve been looking forward to attending together. The flea market part was fun to browse, but the best part was checking out the CARS! Many people come to the Rhinebeck Car Show & Swap Meet to buy parts for their cars. To the untrained eye (like mine) it looks like lots of tables covered with rusty junk, but in fact there are many treasures here that can be used help restore cars to their original glory. Enough of that, let’s get to the CARS!! Rhinebeck was brimming with muscle cars. Most popular in the 60s and 70s, muscle cars were factory built, two-door mid-sized cars outfitted with powerful engines (aka the muscle). I just love the color of this 1970 Pontiac GTO. This color would be awesome on the 1969 Chevy Nova I am restoring with my dad. 1972 Dodge Challenger in Plum Crazy. The re were so many Camaros. I loved this one for its gorgeous color. Here is a 1970 Chevy Nova very similar to the one I am working on with my dad, though this one actually has an engine in it! A car show like Rhinebeck would not be complete without some hot rods, which are classic cars from the 30s and 40s reimagined and modified to improve their looks, speed and power. Not sure what this gorgeous thing is, but it’s pretty fabulous! This guy clearly loves it. Another beautiful paint job. The bright pink on this Mercury is so stunning! I would love to paint the Nova this color, but my dad says no pink! What does he know?! I still don’t quite know how to explain what a rat rod is exactly, but they have a junk yard charm quite a bit different from traditional hot rods. Rat rods also have an over the top, exaggerated aspect to them, kind of like this one with two engines. My favorite car of the day was this convertible 1962 Dodge Rambler. Most of all, I loved the coordinating dash and steering wheel. It looks like so much fun to drive! I would need to dress up (including proper handbag and full skirt) everyday just to feel like I was doing this car justice. Perhaps the cutest car ever. 1970 Subaru 360. 1957 Chevrolet Bel Air. 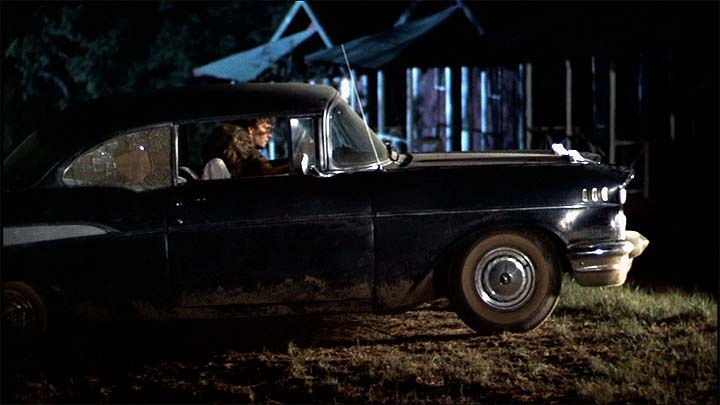 You might also recognize this as the same car that Johnny Castle drives in Dirty Dancing (though his was black). This is the Amphibicar. I’m not joking, it’s a car and a boat all in one. It can legally drive or set sail. Check out the pair of propellers, which you can see poking in the bottom left photo. Love this Ford dash. They don’t make dashes like they used to! This 1963 Corvette’s split window is an example of design trumping function. The designer thought it was très chic, but no amount of style could change the fact that people simply couldn’t see out the back window. Produced for only one year, it is super rare and thus popular with collectors. I didn’t get to go home with that adorable Rambler, but did take home this vintage Royal typewriter for only $20!